Tiffen 5.65 x 5.65" Vector Star Filters create multiple points of light, or "stars," streaking outward from a central light source. Star Filters create multiple points of light, or "stars," streaking outward from a central light source. Shooting at night? 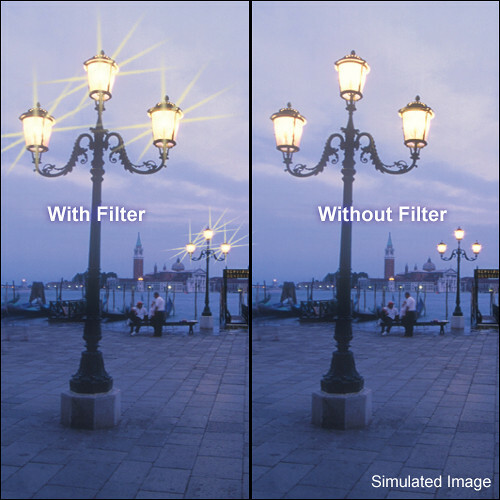 Make that street lamp take on a different, more dramatic appearance by using the star filter. Any point light source will achieve the effect. The ColorCore process allows Tiffen to control the color and density of their filters, and the characteristics of special effects filters with much greater accuracy than typical dyed-in-the-mass filters, which usually exhibit color and density variations.